Candidate relationship management (CRM) is the act of managing your relationships with potential applicants. It starts from a candidate's first contact with your company and continues on, potentially through their recruitment process, but also continues on with passive candidates who may not be ready for a new position just yet. Regardless of whether its a relationship with a potential hire or a passive candidate, CRM is focused on staying in touch and making the relationship mutually beneficial. This will give you a step ahead when it comes time to recruit them. Candidate experience describes the sum of the experiences and perceptions that an applicant or potential employee has with the company during the hiring process. This includes the job search, application process, interviews, and even onboarding. As a company, your goal is to provide applicants with the best possible candidate experience. You want to stand out from other companies and be known for putting the candidate first. The difference between CRM and candidate experience is that candidate experience is a part of CRM. 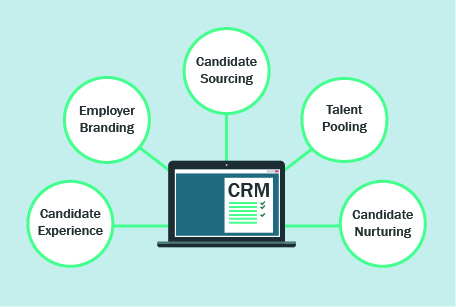 CRM is made up of several different parts of the recruiting process, including candidate experience, employer branding, candidate sourcing, talent pooling, and candidate nurturing. In order to have successful relationships with candidates (CRM), you need to create a positive candidate experience. Without this piece, your CRM will be missing the part of the process that is focused solely on the candidate. To ensure that you’re including candidate experience in your CRM strategy, make sure you evaluate everything from the candidate’s perspective. For example, is your career page designed in a way that is eye catching and easy to navigate? Does it contain all the information that each of your target groups would be looking for? If you look at each part of your recruiting strategy and imagine how the experience will be for the candidate, you are sure to have success with both your candidate experience and your CRM. Would you like to learn more about CRM and candidate experience? We will gladly show you further best practice examples and how you can implement CRM strategies with the Talention software. You can request a demo here and someone will get in touch with you shortly. Request a demo now.